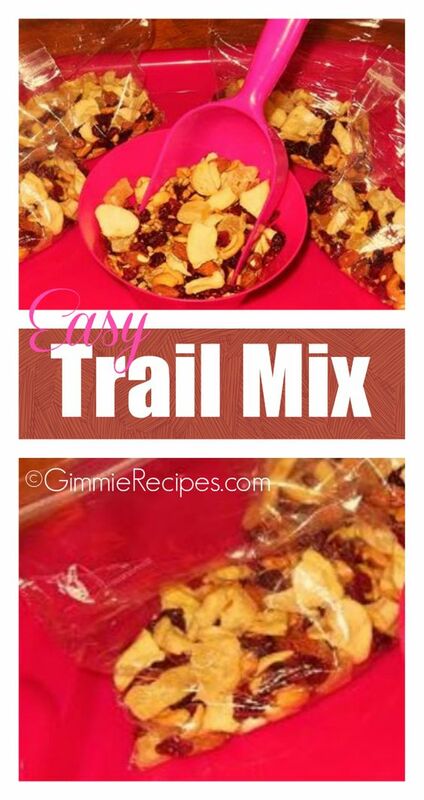 Try out this easy DIY Trail Mix recipe! It’s a great source of protein, and perfect for on the go. It will also save you a bunch of money by creating your own mix. You can make it special by adding in some of your own favorites (be sure to check our recommendations below!) Make it healthier by cutting out candy-coated chocolates found in most name-brand varieties! Like this? Pin it or RePin It on Pinterest! In this recipe I used unsalted nuts, and the very least sugar-coated dried fruits I could find. That’s what you really want to look for while shopping for your own ingredients. You want to avoid extra sodium (salt) and sugar. If you have the time, you can dry your own fruits and control what’s in them. I have an old Ronco Food Dehydrator – my parents got it at a garage sale and we share it. Everyone in the family has put it to good use! This recipe goes great with the Nutrisystem diet by providing 2 SmartCarbs, and 1 PowerFuel, and 1 Extra per 1 cup serving, making it perfect as a snack option throughout the day, or even a yummy addition to your breakfast cereal or yogurt. Feel free to add in some granola, or other Nutrisystem approved fruits & nuts, and change it up to include what you like! A whole cup is a lot of calories though, so I’d recommend more like 1/4 cup or less if you’re adding to another main ingredient. Please note: trail mix is meant to provide calories and nutrients needed to keep you moving on the trail. It’s generally NOT low-calorie. Just because the ingredients are healthy doesn’t mean you should eat a lot of it. Trail mix should be eaten only in small amounts as an occasional snack. It’s a great snack when you’re hiking! Idea: whip up a batch of trail mix, and then bag it up as individual snacks to grab on-the-go! Oats: Toast rolled oats on a baking sheet in the oven. Flavor with vanilla extract or sprinkle of cinnamon. Adds fiber and helps reduce cholesterol and protect the body from heart disease.